Bank of America strode through the wreckage of Wall Street yesterday holding its prize aloft, extolling the great opportunity of acquiring Merrill Lynch and its “thundering herd” of 16,000 salesmen. The speed at which America's biggest commercial bank sealed a $50 billion (£27.9 billion) share deal to buy Merrill has stunned Wall Street and the City of London, prompting questions about whether the two firms were nudged by nervous officials at the Federal Reserve Bank in New York fearing another collapse, or whether Merrill had been in talks with other banks. My Translation: "The pressure from the Fed was enormous. Anyone in their right mind knows this deal makes no sense to Bank of America". The Merrill chief said that the deal “made all the sense in the world”, but he appeared more subdued yesterday than his new commercial banking partner. My Comment: This deal makes perfect to Thain (but no one else). After all, Thain can collect a payout of $10 million if the deal goes through. "Mr Thain, who received a $15 million golden hello after taking over at Merrill last December, could collect a payout of almost $10 million if the deal goes through, according to estimates by a pay advisory firm". His staff is likely to feel the same way, for the merger will entail significant lay-offs, which are as yet unquantified. Bank of America has identified $7 billion of pre-tax cost cuts, of which a fifth will be earned next year. That would imply hefty job losses in America and probably in Britain, too. Mr Lewis emphasised that the cuts would come from both companies. My Comment: Cuts will come from both companies and Merrill Lynch will bear the brunt of them. Standard & Poor's cut Bank of America's long-term credit rating one notch to “AA-minus”, its fourth-highest grade, saying that the merger “carries integration risk, particularly since it comes during a period of severe market turmoil”. Moody's Investors Service said that it might cut its “Aa2” rating for the bank, its third-highest grade. Fitch Ratings affirmed its “A-plus” rating, its fifth highest. My Comment: Bank of America just bet the firm and all three rating agencies act as if the only risk is integration. Once again, pathetic action by Moody's, Fitch, and the S&P. Thundering Vote Of "No Confidence"
The market responded to this deal with as stunning a vote of no confidence as you will ever see. Inquiring minds are asking for proof. It comes in the form of 10 minute charts. Bank of America (BAC) was hammered a whopping 21% for its ridiculous offer for Merrill Lynch (MER). Clearly the market thinks Bank of America overpaid and so do I.
Merrill Lynch which gapped up to $21 (the offer was for $29), gave every penny of it back and closed at $17.06. It is highly likely that Merrill Lynch would have fallen to $14 or $15 (if not a lot more) in the wake of the bankruptcy of Lehman (LEH). CEO Lewis had to know that, and he had to know there would be enormous pressure on Merrill to do something today if only he waited one day. If he did not know that, then Lewis is incompetent. By the way, there is one other possible explanation for this foolishness: Lewis was in a mad rush to enhance his Ego. This merger (if it goes through) would create a behemoth that would rival Citigroup (C) in terms of assets under management. Lewis, in an impatient state did not care what he paid to achieve that fame. The Market Cap of Merrill Lynch was $26 Billion last Friday. Today the Market Cap of Merrill Lynch is $26 Billion. 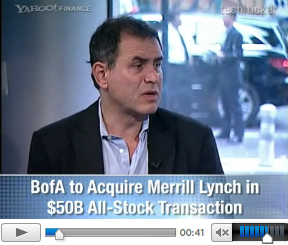 The all stock offer for Merrill Lynch was for $50 billion. The Market Cap of Bank of America was $153 Billion last Friday. Today the Market Cap of Bank of America is $121 Billion. Roubini Calls Merger A "Reckless Deal"
The action in Bank of America (BAC) today is a stern warning to JPMorgan (JPM) to not get cute and buy Washington Mutual (WM) even though that is exactly what the Fed would like to see. The moral of this story is: The strong swallow the weak until the strong become weak.